Since I am in the US for a week, expect a daily taste test to see how the Americanized versions of our favorite dishes stack up to the real deals. 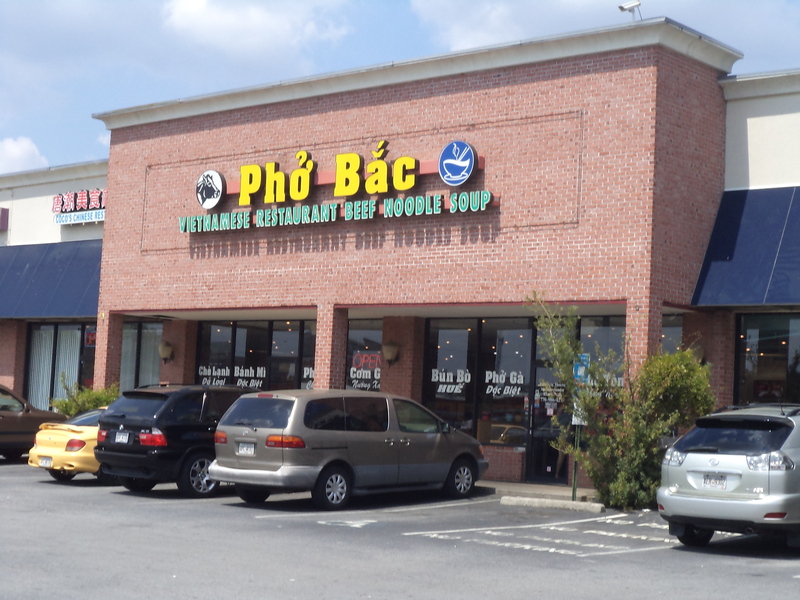 Our journey into metro Atlanta’s Vietnamese community begins at its epicenter on Buford Highway in DeKalb County. This area is actually known locally and somewhat colloquially as “Chambodia” which is a play on the city of Chamblee (pronounced Shamblee) crossed with Cambodia. Though it’s not so nice to call it that, I just want you to have all the details good and bad of where we will be eating ourselves fat the next few days. Pho Bac Viet Restaurant right on this main drag at 4897 is the beginning of our culinary journey. Just rolling up on this soup joint in a quiet strip mall by car rather than on foot or motorbike the Vietnamese way began an onslaught of differences causing me to yearn for Saigon. Also absent are kiddie size stools on a sidewalk or an open front building sizzling in the heat. This Atlanta restaurant actually has a door, air conditioning and adult size furniture. The West just has it going on! I felt so out of place in these most sterile environs, and even the health department inspection sign announcing to the world this place scored a 90 caught me off guard. I think Pho Bac Viet scores a full 89 points higher than its counterparts of more dubious hygiene standards back in Vietnam though! Ordering takeaway in Vietnamese in an English speaking country was my first faux pas of the morning, and the waiter stared at me like I had dropped down into the restaurant from Mars. He was wholly unable to interpret my wishes for “mot bún bò Huế,” and the Vietnamese speaking owner rushed over to salvage this transaction. Now with my order finally written down, the waiter disappeared into the back but within a minute returned to ask if I wanted the congealed pig’s blood and pigs knuckle included. “Of course,” I said, and that a restaurant in America would even have these two fine Vietnamese delicacies told me an amazing bowl of soup would soon be speeding away in my truck. A minute later another waiter came out of the kitchen to again verify I indeed wanted these two items seemingly offensive to Western tastes. A confirmation of the affirmative in both English and Vietnamese to cover all bases caused him to look at me like I was some sort of western aberration. Any similarities to a proper Vietnamese bowl of bún bò Huế end with that square chunk of crimson congealed pig blood. Now I do realize that sourcing ingredients must be difficult in the US, but still… First off, the broth was more a flat, brownish beef pho concoction than a spicy something properly tinted a deep red by annatto seed oil. Mouth burning Jalapeno peppers replaced the traditional gut searing red birdseye chili peppers while shredded purple cabbage garnish added a flavor completely different than the traditional shredded banana leaf and water spinach. However, it did taste good. It was just too Americanized for my growing Vietnamese tastes. The price tag actually is the most apparent difference between bún bò Huế Atlanta and bún bò Huế Vietnam. A wallet busting $7.99 plus tax for a huge bowl that could easily feed a family of four in Hue is a lot for someone so used to Saigon pricing. I miss my $1 to $1.50 price tag for a right sized portion that doesn’t leave me feeling compelled to consume the daily recommended allowance for three days such as the supersized American version. One meal down, several more to go. Surely some sort of authenticity lurks deep in Little Saigon. I am on a mission to find it even if I have to cook it myself. Amazing coincidence. I ate at that same restaurant a few months back. The 39 bus that runs along the Buford Highway, from downtown to Doraville Station, would have been a much more interesting ride. It gives you the up-close-and-personal look at the changing South. You’d see the changes by the faces, languages spoken and the ethnic dresses of the bus riders, from Cambodia to Yemen. A great ride. First of all, as far as “sourcing ingredients” go, there’s no limitation in the US. In fact, I believe, in that same strip mall there is that famous 99 Ranch Market, the mother of all Asian supermarkets in the US. It started out as a Taiwan-based, but is now HQ’ed in California. You want it, they have it. It’s the biggest and the best of all things-Asian-kitchen in California. Another thing is many Asian immigrants have begun to grow tropical fruit and vegetables for Asian, as well Latino & African immigrant consumers, in the South and, especially in Florida. In California there are many Cambodian, Hmong and Vietnamese farmers doing likewise. Mexico, specifically Baja, has become the major grower of tropical fruits and vegetables for the Asian immigrant consumers in the US. My tiny kitchen in California is better stocked than an average restaurant in Vietnam. A rather pertinent point is the bastardization of the food, especially Vietnamese and Thai food in America. Many Thai restaurants are owned and operated by immigrants from Laos. And when it comes to Vietnamese food, it is rather interesting, neither good nor bad, but understandable. Take the Bun Bo Hue you had ordered, it was very likely that 1) neither the owner nor the cook at that restaurant came from Hue or anywhere near Hue, 2) they didn’t grow up with that dish in Vietnam and lastly, they had no formal training. I’ve tried this very dish, as well as Bun Rieu, almost everywhere I find a Vietnamese restaurant outside California. Unfortunately, no two are alike and remotely resemble what you would find in Vietnam. Vietnamese food changes the second people like me step off the plane. 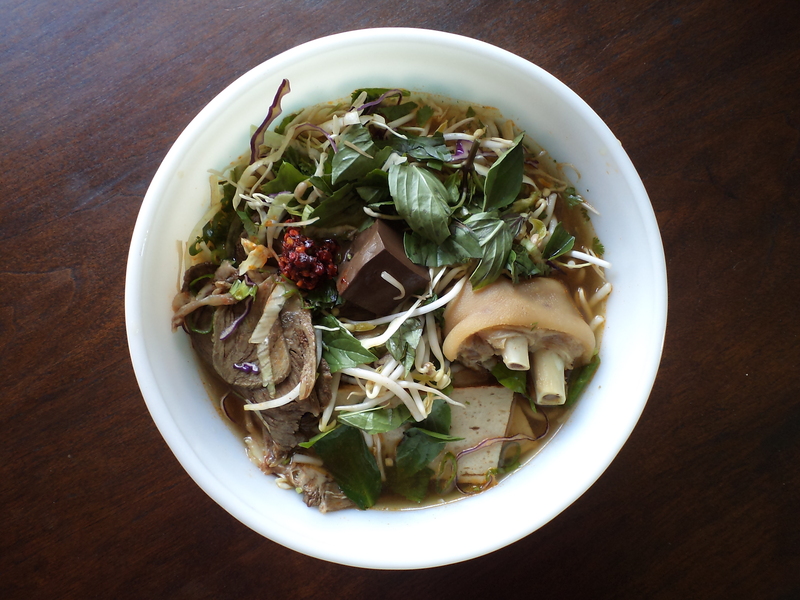 There is no such thing as authentic Vietnamese cuisine in the US. At best, it’s a combination of interpretation & guessing or a concoction at worst. However, this is not to say there is no good Bun Bo Hue to be found. In my hometown of Oakland, California, we have a restaurant that probably would score around 50 on the public health scale, but their Bun Bo Hue is close to 90. And the owners are from Quang Ngai, not Hue. Am glad that you recognized what you had being American. 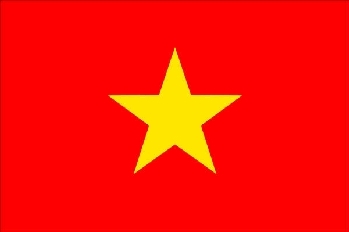 Welcome to Vietnamese America. Interesting observation. Thanks for blogging.